Black Legion "Let Loose the Dogs!" 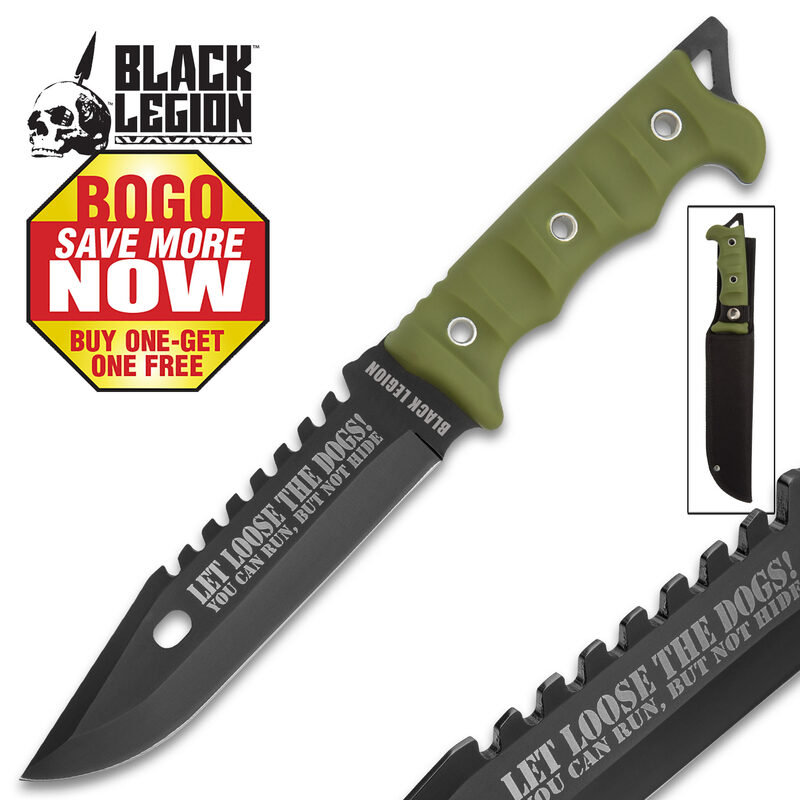 Fixed Blade Knife with Nylon Sheath - OD Green Handle - BOGO | BUDK.com - Knives & Swords At The Lowest Prices! Bold patriotic blade etchings and tough-as-nails construction make Black Legion's "Let Loose the Dogs!" Fixed Blade Knife equally at home in remote back country and the display case. And with its surprisingly affordable price, it's painless to get two - one to showcase and one to use! Extraordinary features like a 6 3/4" black-coated stainless steel clip point blade, sawback blade spine, ergonomic polymer grip and lanyard hole make the "Let Loose the Dogs!" Fixed Blade one of the best values on the knife market. Its in-your-face, unapologetically patriotic blade etchings especially set this distinctive knife apart. "Let Loose the Dogs!" and "You can run, but not hide" is carefully laser etched on the razor sharp blade. Proudly show off this cool fixed blade to friends, family and acquaintances - let 'em know where your loyalties lie! It's also a valuable companion while camping, hunting or embarking on other outdoor adventures, with its lightweight-yet-durable build, versatile 12 1/4" size and included nylon belt sheath. Regardless of how you use it, rest assured Black Legion's "Let Loose the Dogs!" Fixed Blade Knife is up to the task for the long haul. Every red-blooded American needs at least one in his or her arsenal and, now, we're giving you two for the price of one!